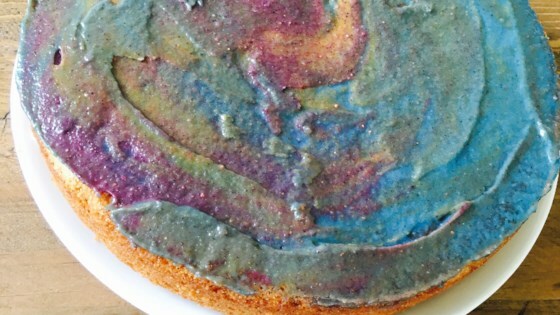 "This galaxy cake topping is vegan and uses natural dye made from fruits and plants powder and cashew nut cream. All super healthy to offer to the kids with no fault!" Combine cashews and water in a bowl and soak in the refrigerator for 4 to 12 hours. Drain and rinse under running cold water in a sieve. Combine cashews, agave nectar, coconut oil, soymilk, vanilla extract, and lemon juice in a blender; blend until smooth. Divide cashew mixture among 3 bowls. Add blue spirulina to one, beet powder the the second, and turmeric to the third bowl; stir each bowl to combine until evenly colored. When frosting a cake, place the 3 colors next to each other on the surface and blend with a spatula to create a galaxy effect. Instead of beet powder you can use blueberry powder to achieve a red/purple color and acerola for yellow.